Seven Seas Entertainment, 9781933164717, 200pp. Something has happened in the heart of Aldenmor: the Fairy Glade has vanished New animal refugees are arriving in Ravenswood, including a mysterious, wild unicorn. The creature is frightened, confused and wounded. Emily faces her greatest challenge as a healer to save the unicorn. 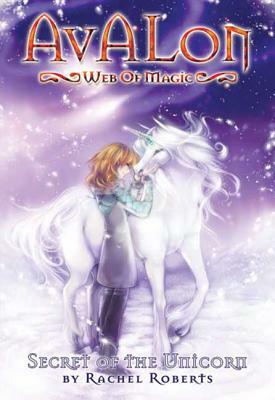 "Secret of the Unicorn "is the fourth book in "Avalon: Web of Magic," a twelve book fantasy series by Rachel Roberts for middle grade readers. Through their magical journey, the teenage heroines discover who they really are . . . and run into plenty of good guys, bad guys, and cute guys. Out of print for two years, Seven Seas is pleased to return the Avalon series to print in editions targeted for today's manga-readers, with new manga-style covers and interior illustrations. Rachel Roberts is the author of Avalon: Web of Magic. She revised the entire 12-book series for this republication. Roberts toured extensively for the first release of the Avalon series in the "Avalon: Music is Magic" Tour, a scripted musical event featuring songs, prizes and author signings. She lives in southern California.